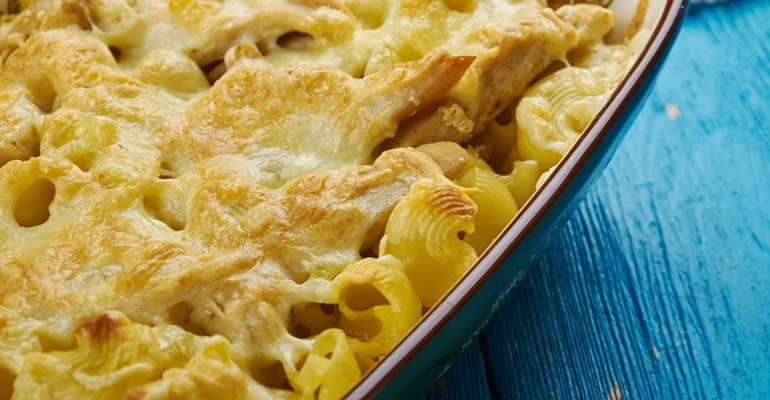 Have you been looking for an easy, creamy casserole to make for dinner? You can stop searching! This Chicken Alfredo Casserole is a great choice. It brings gourmet flavor to your dinner table – and you don’t have to slave away in the kitchen for hours. I have a box full of go-to recipes for those crazy days when I want to serve something nice but don’t really have the for cooking. This is one of my favorites. Chicken Alfredo has a fancy name, and if you like creamy, cheese-rich dishes, it does sport great Italian-style flavor. Turning this classic recipe into a casserole is a great way to speed up the process and reduce the workload. After all, you’ve probably got hungry kids and family members to feed, right? Who wants to listen to them howl about how hungry they are any longer than you have too? Not me! So, I’m always thankful for recipes like this because it’s easy to make, tastes good, and very filling. Everyone is usually happy with it, too! This includes my two picky eaters… you should have seen how fast they gobbled up their first servings and went for seconds! Quick Tip: Coat the baking dish with cooking spray!